The only pads you’ll need when using your Griot’s Garage BOSS G15 or G21 Long Throw Orbital Polisher! Part of what makes a polisher or buffing machine great is the types of pads used in conjunction with said polisher or buffing machine. Griot’s Garage kept this in mind while engineering the pads that go hand-in-hand with their BOSS System. Due to the large throw of both the BOSS G15 and G21 Dual Action Orbital Polishers, they had to be sure the pads used with those machines would hold up to the power. 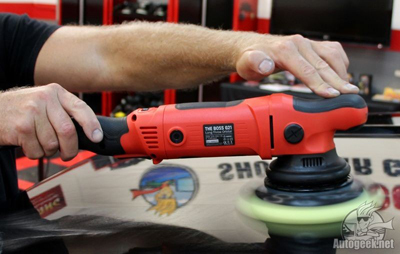 Their 8mm thick BOSS buffing and polishing pads have been designed for just that. Their low profile build and light weight makes for increased tool stability and a smoother operation all around. The open-cell structure of the Griot’s Garage Foam Buffing Pads makes for less heat build-up and increased durability, allowing you to use fewer pads for one job! Designed to work with their “Smart Heat” backing plates, there is a center hole that also reduces heat build-up. The specialized chamfered edge helps prevent the backing plate from making contact with the paint – trust us, you do not want that to happen during a 4 hour detail! The color coded feature of the Griot’s Garage Foam Buffing Pads eliminate guesswork when selecting products and pads and helps to tell you the aggressiveness of each pad. You’ll never have to guess what the orange pad does again! Another huge benefit of the Griot’s Garage Pads is the Thermo-Set Bond used to attach the foam and pad backing. This makes the Griot’s Garage Foam Buffing Pads extremely durable. When you’re done for the day and ready for clean-up, simply throw your pads in the washing machine; they’ll be just fine! When you need fast defect removal, use the BOSS Microfiber Pad with Griot’s Garage Fast Correcting Cream or Griot’s Garage Correcting Cream for increased effectiveness. The plush 10 mm nap amplifies your chosen polish or compound for maximum swirl and defect removal. The Griot’s Garage BOSS Microfiber Pad finishes extremely well and will reduce subsequent steps in paint correction. The White Foam Pad made with a firm euro-foam is used with Griot’s Garage Fast Correcting Cream or Griot’s Garage Correcting Cream for paint defect removal. When used with the Fast Correcting Cream it can remove severe swirls, holograms, and water spots. Use the Orange Foam Correcting Pad with Griot’s Garage Fast Correcting Cream or Griot’s Garage Correcting Cream to remove light to moderate paint defects such as swirls. This pad is not as aggressive as the Microfiber Pad or the White Foam FAST Correcting Pad. Use this multi-purpose for either light defect removal (depending on the product you are using) or for perfecting the paint after already removing swirls and defects from previous steps. Using the Griot’s Garage Perfecting Cream with the Yellow Foam Perfecting Pad leaves a flawless, ready-for-wax finish! When you’ve finished all of your paint correction and polishing steps, use the ultra-soft Black Foam Finishing Pad with the Griot’s Garage Finishing Sealant to protect your newly perfected paint. Keeping your foam and microfiber pads clean will always extend the life of said pads. Be sure to keep them clean throughout your detail as well as a thorough cleaning after using the pads. Once compounds are dried and caked onto the pad, it will take you much longer to clean them off! Use a soft bristle brush, like the Foam Pad Conditioning Brush, along with a dedicated pad cleaner to keep your pads working like they did on day one! Griots Garage BOSS G15 Long-Throw Orbital Polisher Free Bonus!